The President, and sole sponsor of Go-round Football Club of Omoku, Felix Obuah, has commended the Rivers Angels Football Club of Port Harcourt for winning the 2015/2016 Nigeria Women Football League (NWFL). Obuah, in a statement signed by his Spokesman, Jerry Needam, in Port Harcourt, said the victory of the Rivers Angels is a testimony that they are truly the “undisputable queens of soccer” in the country, having also lifted the 2016 Women Federations Cup. 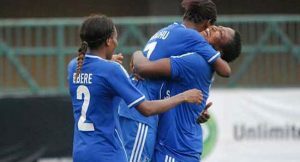 He applauded the angels for their hard work and determination which he said, crowned their effort with a third consecutive league victory, adding that the proud Rivers ambassadors have also set a record as the only female team to win the NWFL five times. Obuah, who is also the Chairman of the People’s Democratic Party (PDP) in Rivers state, added that the victory of the team represents another milestone by Governor Nyesom Wike whose passion for sports development is unrivaled. He described Wike’s administration as a story of sporting glories, recalling recent achievements by Rivers United FC, who finished second in the Nigeria Professional Football League, as well as the exploit of Rivers Hoopers in the National Basketball League. Obuah also commended the coaching crew for a job well done, adding that their technical and tactical inputs provided the tonic in the decisive final match against Nasarawa amazons, in which angels won 5-3 on penalties following a deadlock after regulation time. The go-round FC boss, however charged the girls not to see their victory as the end of the contest but rather a wake-up call for tougher challenges in the new football season. He also called on the Angels to see themselves as role models for upcoming players in the state and country at large. “By the feat you just recorded, you have established yourselves as the all-conquering team in the country. “You are now the team to beat and this singular achievement has imposed a duty on you to work harder to enable you defend both the federations cup and the nwfl shield,” Obuah said. He then affirmed that the successful defense of these laurels would instill confidence in Governor Wike to do more and take the club to greater heights.